Proceeds benefit the Wray Landon Legacy Fund at the Teton Regional Land Trust. Only the first 100 runners are guaranteed a race bag. If you are interested in participating in the Run to the Summit Series you must register as a Run to the Summit Series participant - DO NOT register for each event individually. 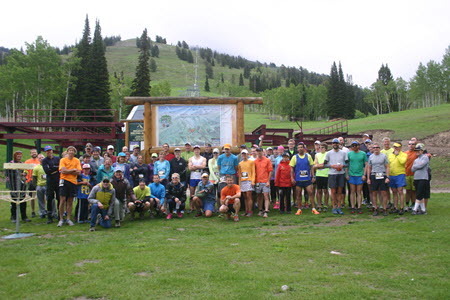 STOP: Are you planning on running the Wrun for Wray - Grand Targhee Hill Climb, Snow King Hill Climb and the Rendezvous Mountain Hill Climb? If so, click over to the Run to the Summit Series page and register for all three events! The roughly 3 mile uphill run starts at the base of the Dreamcatcher chairlift and climbs 1840' to the top of Fred's Mountain. Following the single-track Bannock Trail, (or the Teton Vista Traverse if snow pack is an issue on the trail), the course will feature a water station at roughly 1 mile and at the finish line. First male and female finisher will win a SEASON PASS to Grand Targhee Resort! IMPORTANT: Every competitor should plan on carrying a water bottle or hydration system as the trail is 100% exposed, the weather could be warm and is entirely at altitude (8,000 - 10,000 ft). Also, the course distance may change slightly depending on race day snow pack. Competitors can send extra clothing to the top of the lift with a race official and ride the Dreamcatcher chairlift down after crossing the finish line.